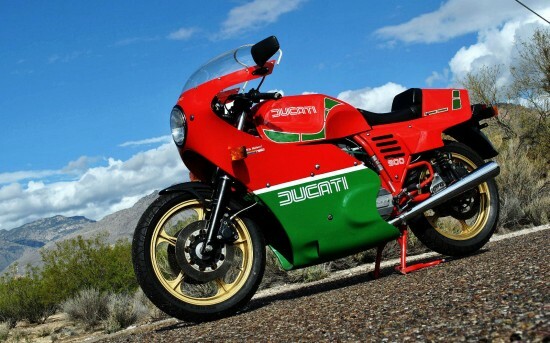 If this machine looks vaguely familiar, it should: our banner image at this site includes the silhouette of Mike Hailwood’s original race bike, the machine he used to win the 1978 Isle of Man TT. Born Stanley Michael Bailey Hailwood, Mike “The Bike” Hailwood ranks up there with Agostini as one of the all-time motorcycling greats. He won multiple world titles during a ten-year career that stretched between 1957 and 1968, riding for Honda and MV Agusta. After retiring from motorcycle racing, he moved on to Formula 1 in the early 1970’s, once of very few to make that transition successfully. In 1978, he returned to motorcycle racing at the Isle of Man TT, then and now the most dangerous event in the world, riding an unlikely machine from Ducati. Against all odds, he won, and cemented his place in Ducati’s racing history. He also got a bike named after him: the MHR or “Mike Hailwood Replica” bikes were basically full-fairings slapped on a largely-stock 900SS. 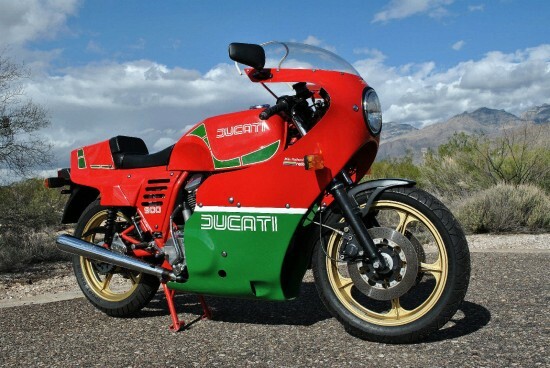 Powered by the “square-case” version of Ducat’s 864cc v-twin and making about 72hp, the bike could hit almost 140mph. Although a cosmetic update to a long-in-the-tooth product at the time it was conceived, these have become very collectable. This particular example is no garage-queen and has covered a tick over 14,000 miles. To me, this is a good thing: nice bikes deserve to be ridden, instead of being condemned to slow decay in a museum or in someone’s garage under a tarp. This is a Japanese edition built in late 1983 and purchased by a US military employee in Tokyo in 1984. We purchased from him last year. This is arguably one of the nicest 83 Hailwoods on the planet. Runs as nice as it looks. Comes with all paperwork and repair records back to the purchase from Muriyama Motors in Tokyo. 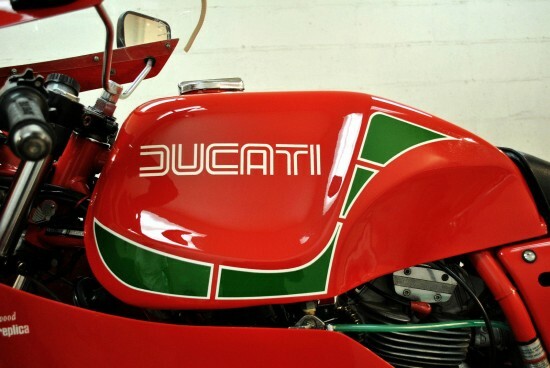 Tank and all bodywork in outstanding shape. Beautiful paint. All bright work looks incredible ( see photos). New this year: Pirellis front and rear, new brakes, new cush drives, new battery hold down, tank hold down, battery tray. New rebuild on the rear master cylinder. New fuel lines (correct green) and clamps. New alternator harness. New steering head bearings. New turn signals. Petcocks reworked. 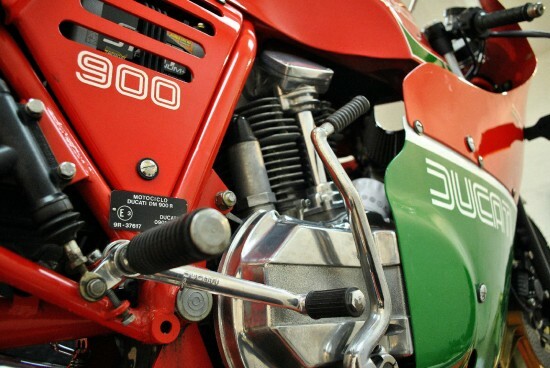 Carbs looked over at Ducati Phoenix. 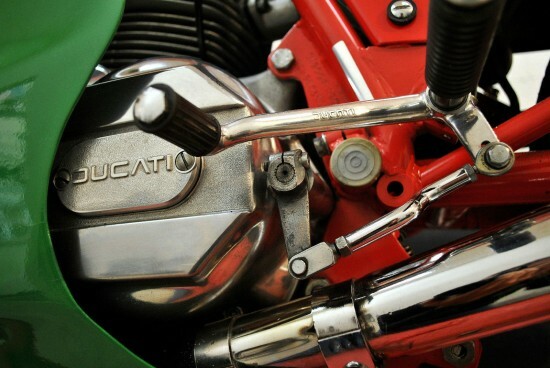 The carbs were rebuilt by the Woods Bros in Cal in an earlier workup. Conti pipes. All services just completed EFX clipons installed. Have original ones. This bike has the optional factory big cams. There has been no engine work except for looking over and dialing in the carbs, oil change (Castrol GTX) and alternator harness replacement. Factory seal on the cases still intact. We have put only 30 kilometers on the bike in the last 14 mos. The seller also includes several videos of the bike, including a walkaround and a ride-by. Interestingly, the paint on the MHR was not intended to mimic the Italian flag. It was patterned after primary sponsor Castrol’s corporate color scheme. There are still several days left on this auction, and this looks to be a great bike for someone who wants to ride their acquisition! I know of one with less than 1100 miles on it. Original EVERYTHING except the battery. Like a museum piece of MH perfection! 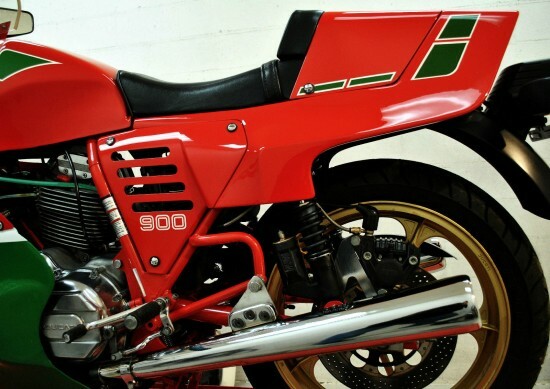 This is a very original bike and appears in great condition. Be apprised that it is one of the very few MHR bikes that has a kick start only SS engine in a frame designed for the then new electric start engine. These frames are not as good, performance or aesthetically, as the earlier SS derived frames. Nice bike though.